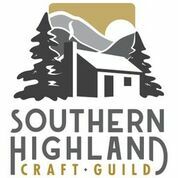 I started my quilting journey as a traditional quilter as many of us have. 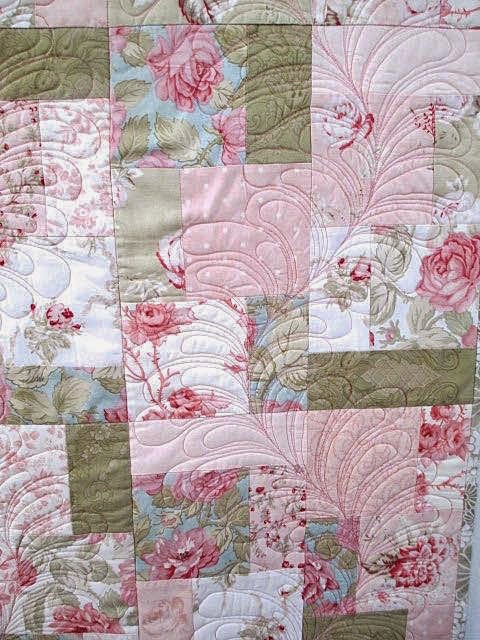 It was great fun learning the patterns, the basics but by my third quilt I was wanting something different. At the very least, I wanted to design my own piece and not use a pattern. Cameo Rose (all hand done) gave me the opportunity to do that. 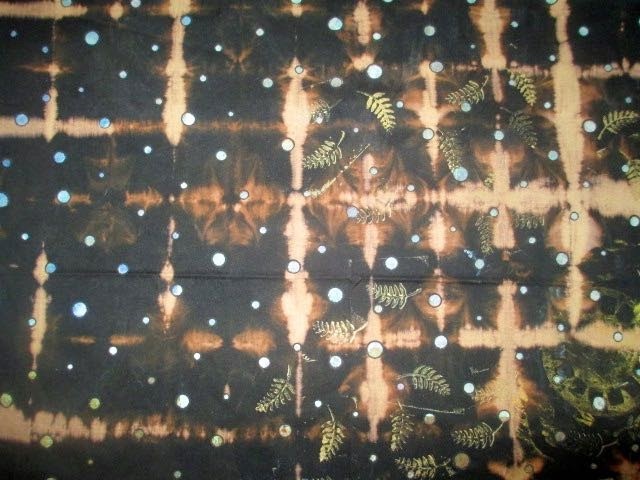 I was still antsy with having far fewer fabric choices than we have today but fabric dyeing came in the next quilt. 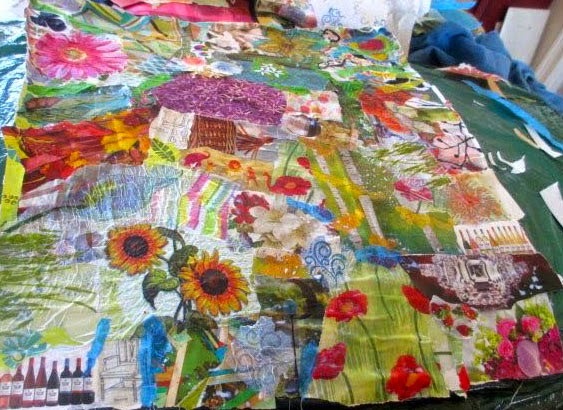 I love creating art quilts but still and once in a while go back to a traditional type quilt. 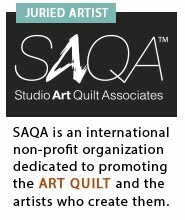 I had collected on my fabric shopping adventures, a beautiful line of Moda fabrics- so much in fact, I was able to make 3 quilts from it. I still have some left - do I dare make another small one? 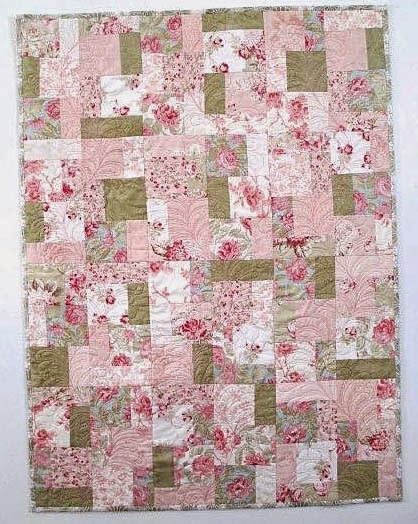 The first one is finished - Pink Chiffon which I posted here a while back. The second one I just finished - I Spy a Rose Garden. 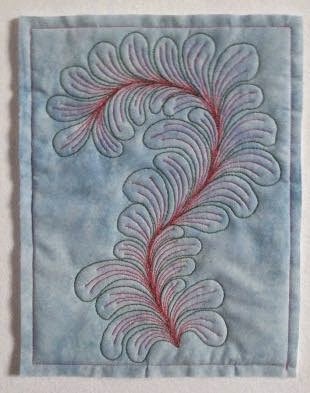 This quilt had such pretty, soft colors I thought it needed some feather quilting. 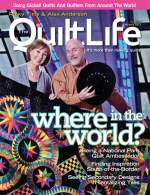 I'm in love with Patsy Thompson's line of DVDs on machine quilting. 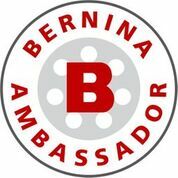 She is incredibly talented, innovative and an excellent instructor. She suggests you make samples of the many kinds of feathers you can do. What you see here is just the tip of the iceberg but it gave me a feel for doing them and the many choices I had. This is the very basic free form feather. Patsy suggests you make a bunch of fabric sandwiches 9" x 12" to work on and they're ready to go. This one has a red arrow pointing to the area I want to highlight. You can see not all are curved feathers but some are "beaked" on the end. This is the "whimsical" feather. I love the heart and enjoyed doing this one the most, it just didn't work with my design that well. The"inlined' feather uses 2 different color threads, the stronger one on the inside of the plume. It's very effective and makes it pop. 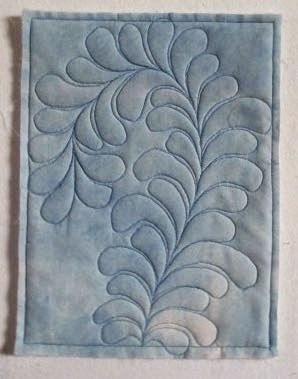 This is the "splay embellished" feather which I also liked but perhaps a little strong for the piece I was using it on. "I Spy a Rose Garden" is finished. The I Spy pattern I've used many times to make chilcren's quilts. 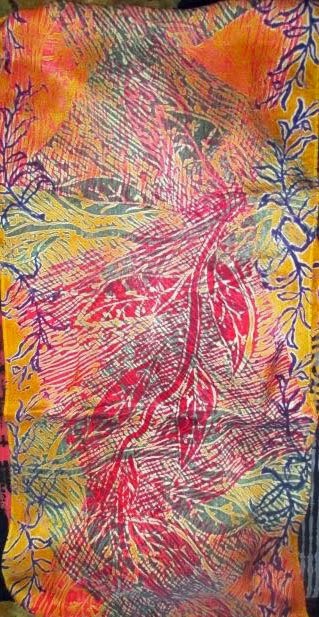 It makes up so well in bright colors but also in soft patterned fabric. I decided to go with the inlined feather which has double plumes but in different colors. I used 2 colors but so close in color and value, it's hard to tell and also the effect I wanted to keep the softness of the look. 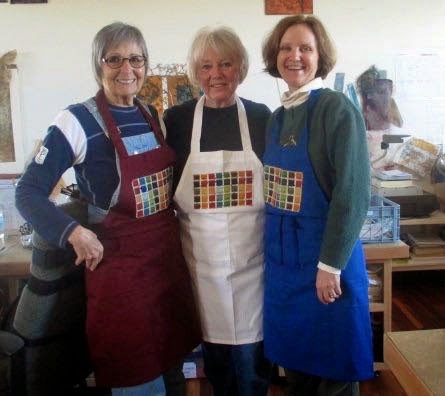 Fun, fun, fun....now back to my dye pots and silkscreens . My 2 year old granddaughter has been here all week, so a busy week, hunting for bears, making caves, baking cupcakes, reading books and trying to keep a 2 year old entertained inside when it's 8 degrees outside. 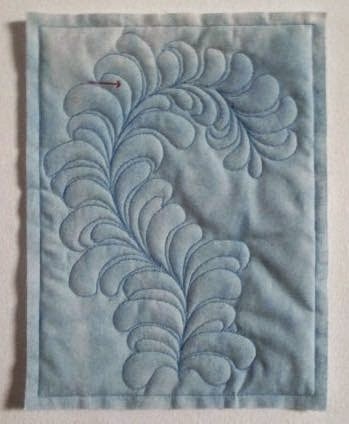 This is a sample from a workshop I used to teach on free motion machine quilting. 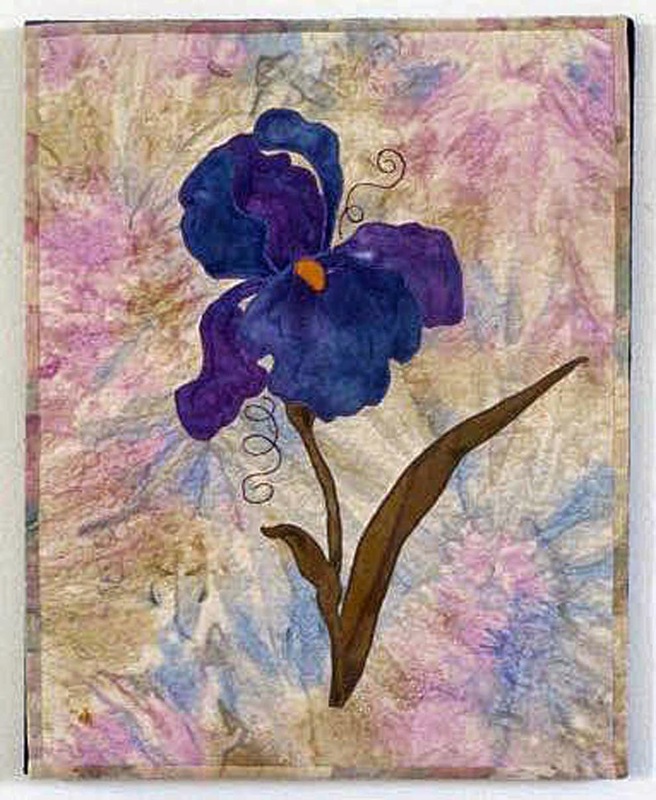 The sample was made with one of my hand dyed fabrics and quilted with a mylar thread; It was so pretty, I hated to just toss it and thought I could extend it into a bigger piece. 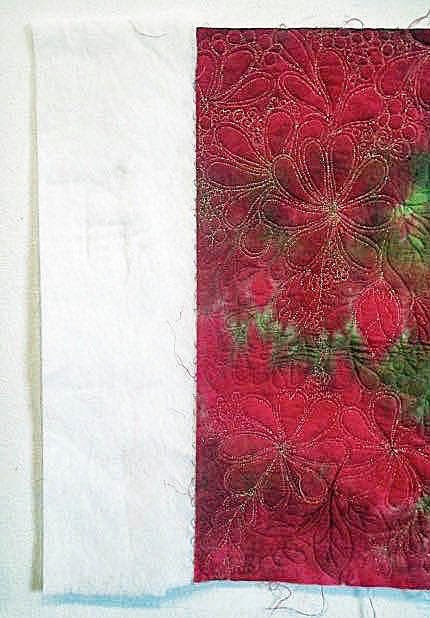 It had already been quilted, so I needed to add a piece of batting of the same weight on the left side. It was a little tricky but it worked. 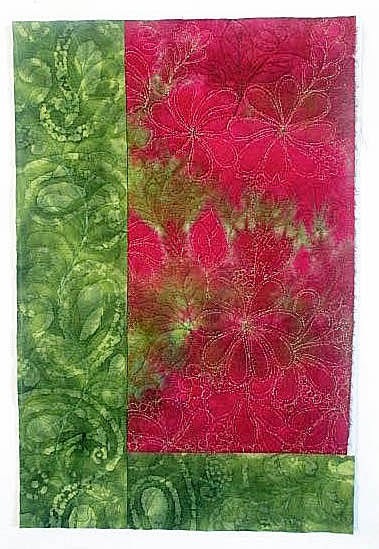 I then added some green batik fabric to bottom and left side to make it a size I thought was pleasing. 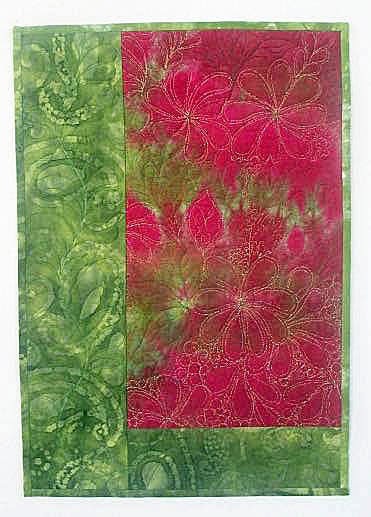 A backing fabric was added to entire back, quilting more heavily in the green area and then using a monofilament, I went back and quilted lightly the area already quilted with a metallic thread, just enough to catch the back. This stabilized everything and held everything on the front to the back. You would never know I used the 2 battings at 2 different times. I bound it with the same fabric and think it came out pretty nice. Sometimes when I'm in a cleaning out mood, I tend to throw out things I shouldn't. I'm glad I did rethink this piece. 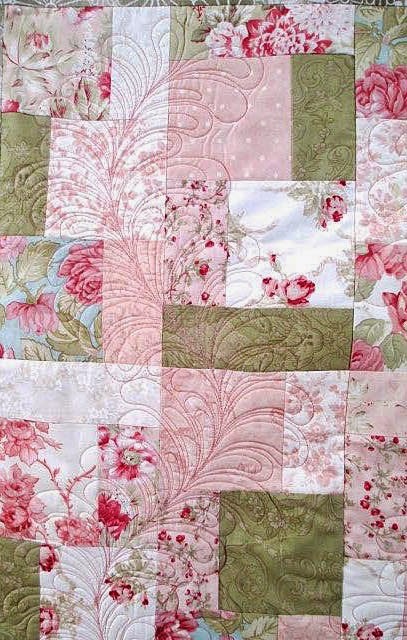 Hope you've had a good week and staying warm - good quilting weather, if nothing else. 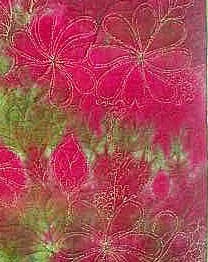 Another sample from a former workshop; I've used this design in workshops so much as it's well received and so versatile. 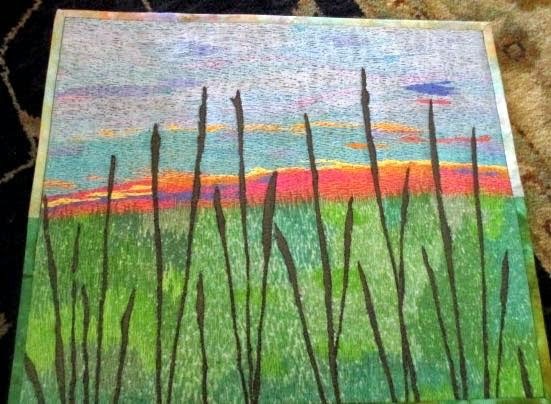 It was almost finished when I came across it and decided to do a technique I learned from Patsy Thompson. Patsy does a "faux" trapunto which I think is very effective. 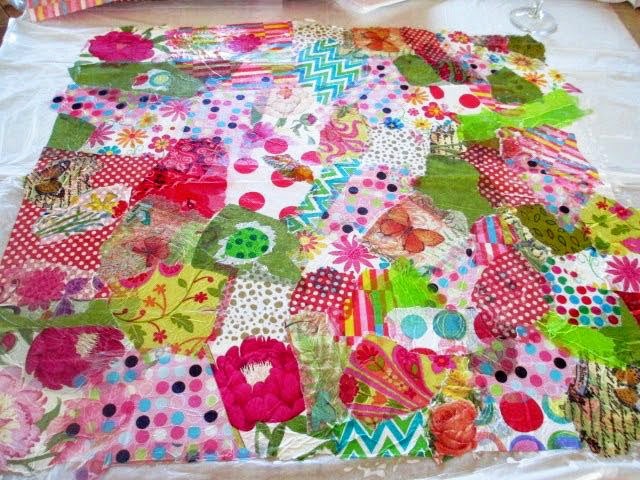 To start, the top is finished as far as appliqué goes, you are ready for quilting - but before you start, turn it over to the back and place 2 layers of a higher loft batting over the area you want to trapunto. Pin it well. 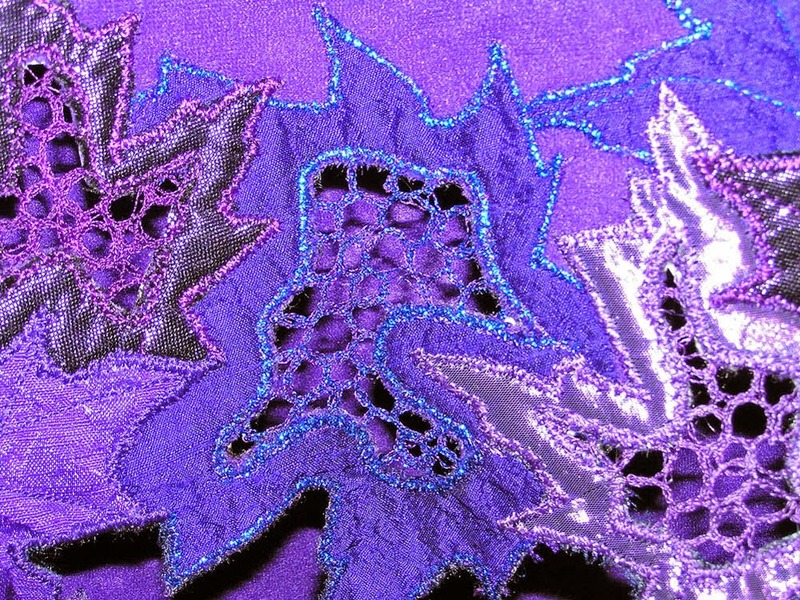 Flip it over to the front and stitch around the edge of the appliqué pieces you wish to have more batting. 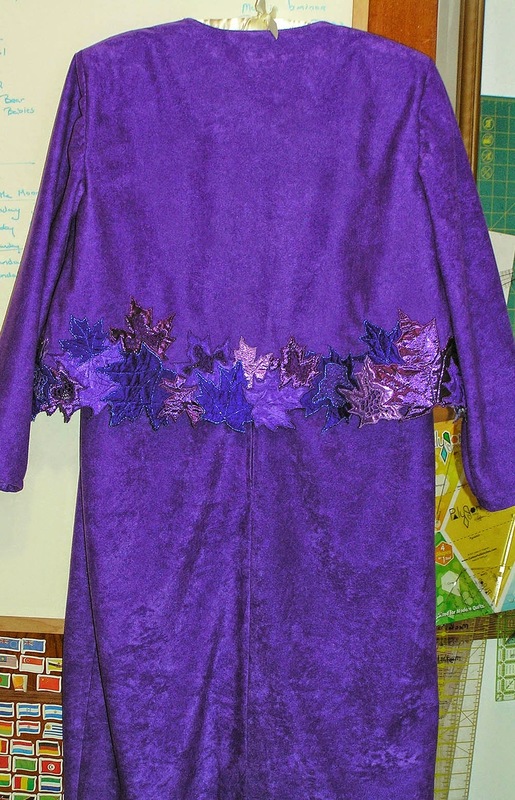 In this case, since it's such a simple design, I used the entire appliqué. And it looks like this on the back. Carefully cut away the excess batting, getting close to the stitching but not cutting it and leaving just the applique with extra batting. 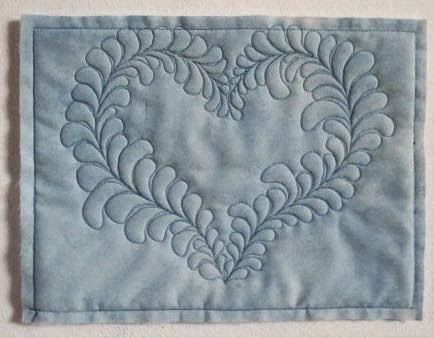 Next, cover the back with more batting; you can see the slight outline of the applique with the extra batting underneath. Ordinarily you would also put a backing fabric in place but this piece is being mounted on a pre-stretched canvas so I omitted that. 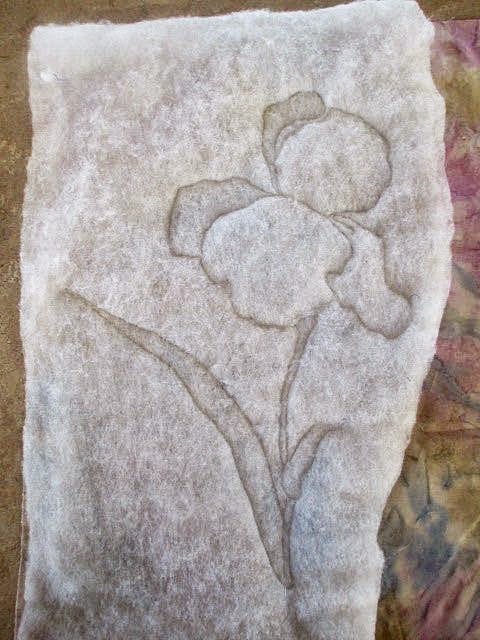 Set your machine for free motion and quilt like crazy - outlining the appliqué and some of the detail lines inside. 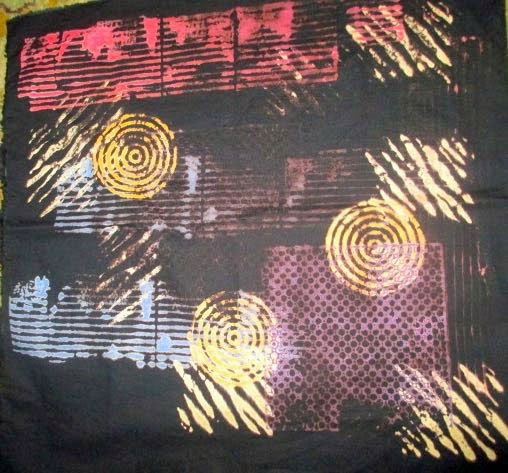 You don't want to stitch too much inside the "extra padded" area as it deflates it and you lose the effect of trapunto. 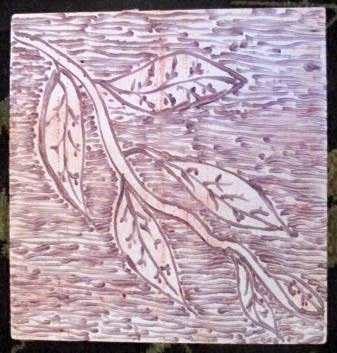 This piece was mounted around a pre-stretched canvas. 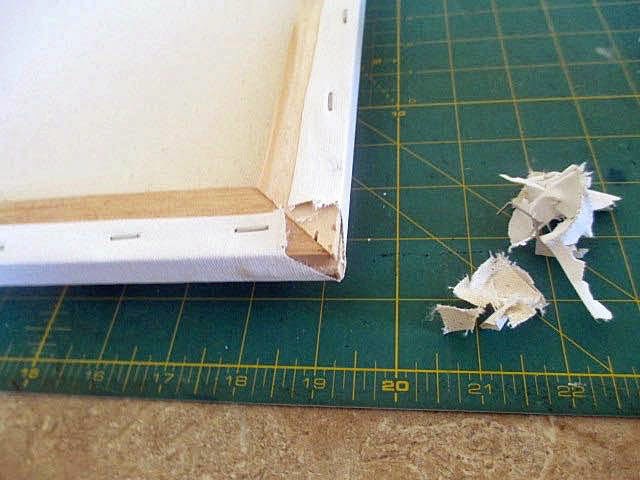 There is usually so much bulk at the corners; I remove it VERY carefully using an exacto knife! 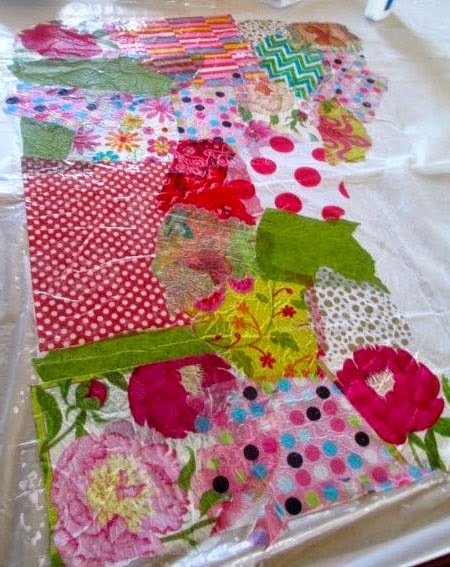 Doing this will ensure a much flatter look at the corners where there is an excess of fabric. 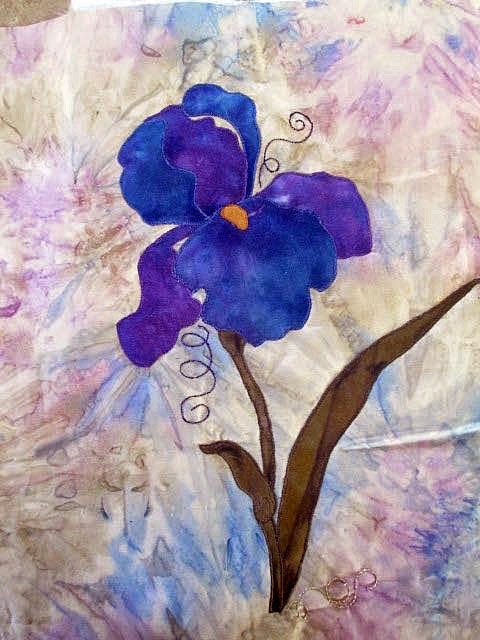 The finished piece - Watercolor Iris. I like the use of the batik as a background. It adds some personality to the piece. Sharing our work is perhaps the most fun part of our group, well, every part is fun but getting to see what each of us have tried during our month apart is always inspiring. Denny and Kate who live a stones throw away from each other, often get together to experiment. 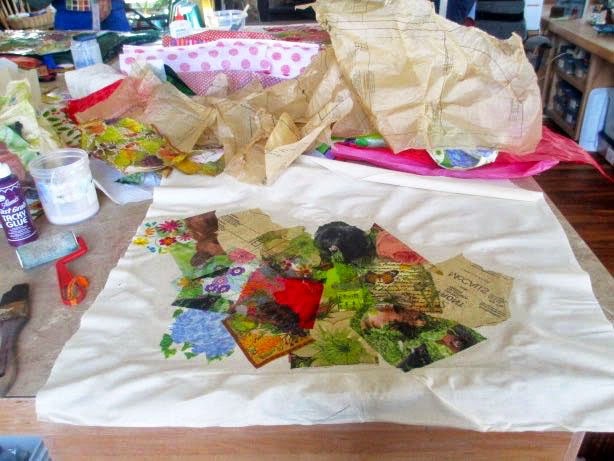 Recently they were working on fixing up "bad" fabric which were greatly improved after working on them. I think they are both loaded with perseverance and will not give up until they have achieved success as seen below. 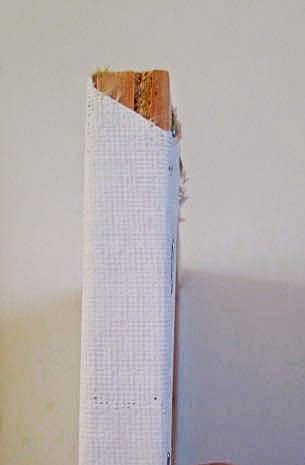 I loved this piece of Denny's which had holes in it, was folded and discharged. 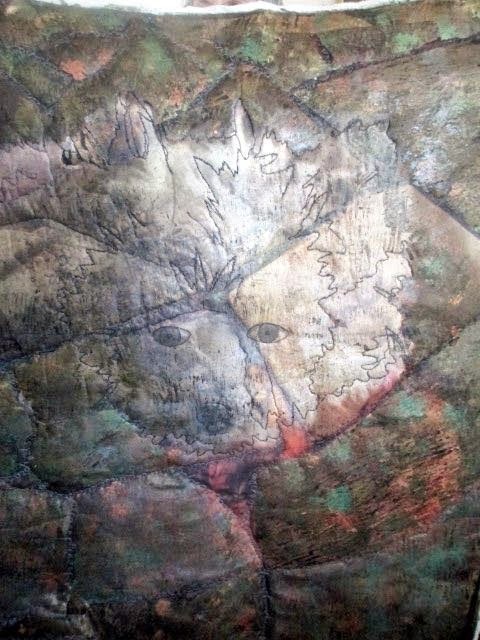 This is Denny's latest quilt - a detail of Angel - her Westie who died a couple of years ago. 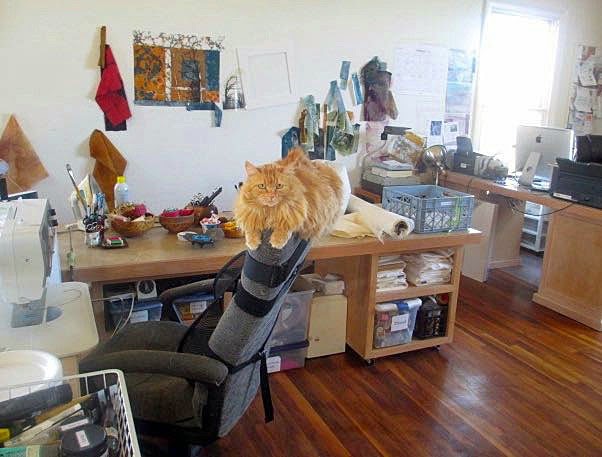 She had a photo of Angel printed on fabric through Spoonflower and there it stayed on her design wall for a while. Sometimes it's good to let things stew. 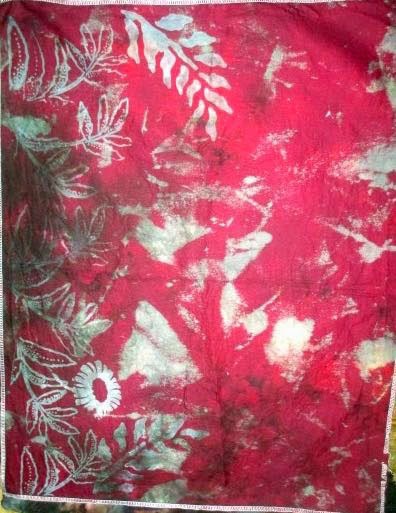 Denny painted fusible web which accounts for all the surrounding fabric. Angel although a prominent focal point also blends so beautifully into the surounding areas. Denny also took a workshop on Vat/discharge - this was her practice piece. 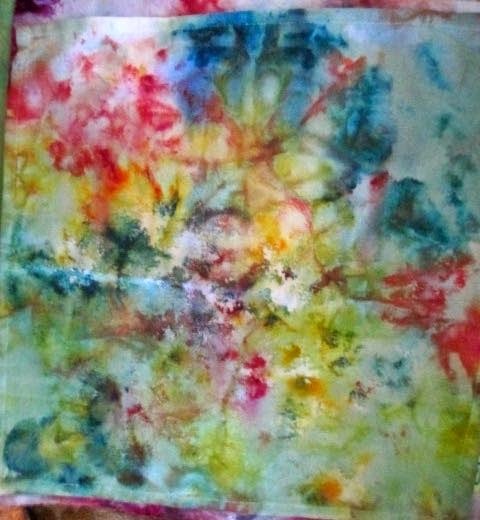 This luscious silk scarf is the result of this class. 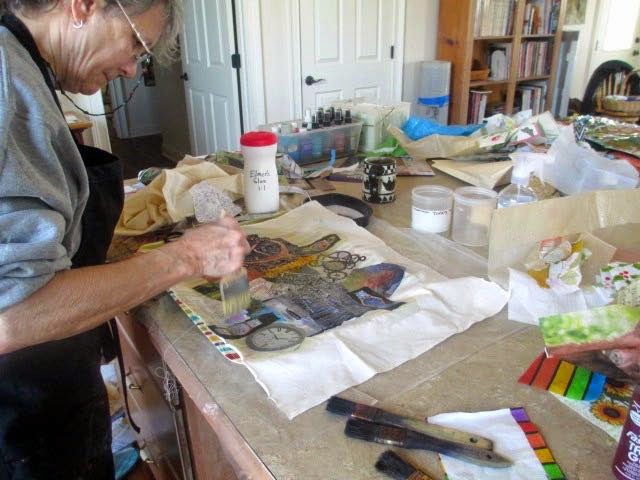 After the discharge/dye process, Denny went back and stamped the entire scarf with a piece of insulation board carved with a design made with a woodburning tool.We all loved this technique and are hoping to do a workshop ourselves. 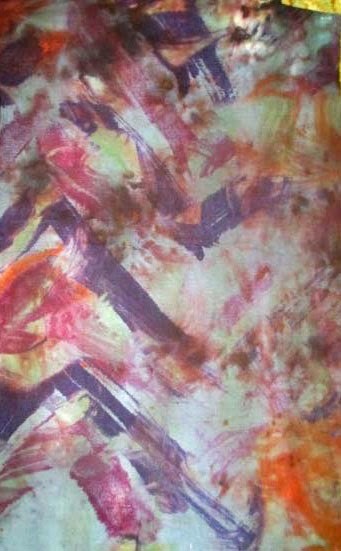 And a piece of "ice dyed" fabric, done in the microwave - our project for March. One of Denny's silhouettes, is it starting to look like Denny had quite a productive month? 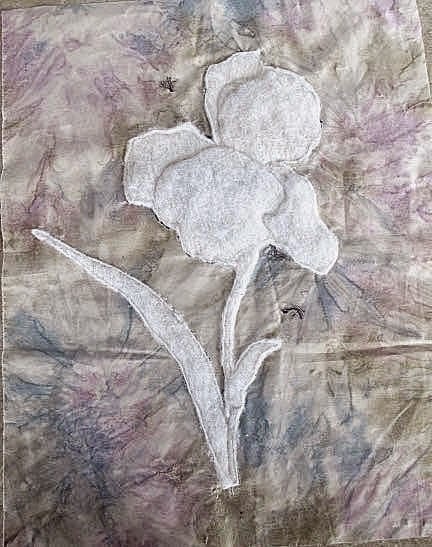 And a piece by Mary; this was lovely in person as the entire surface is covered with stitching - all by hand and it's quite amazing and I imagine labor intensive. Our Fiber Junkies meeting for January was moved back a week due to weather; we're also missing Val (in Florida) and Gen (still under the weather). With only 4 of us, we decided to push the 2 large tables together for 1 large work space. 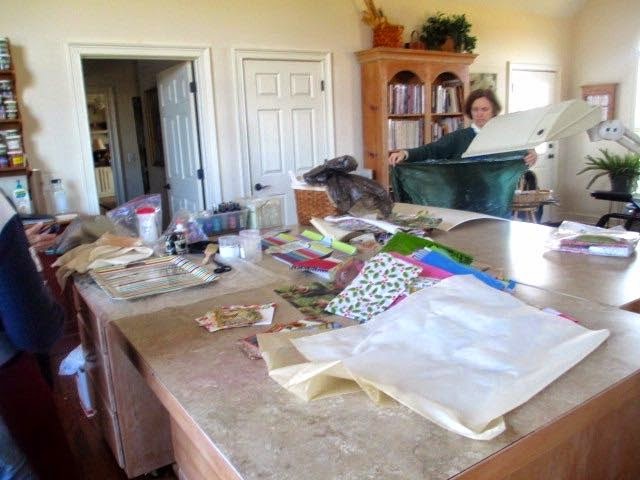 And we really spread out with all kinds of tissue, paper, glue, stamps etc. 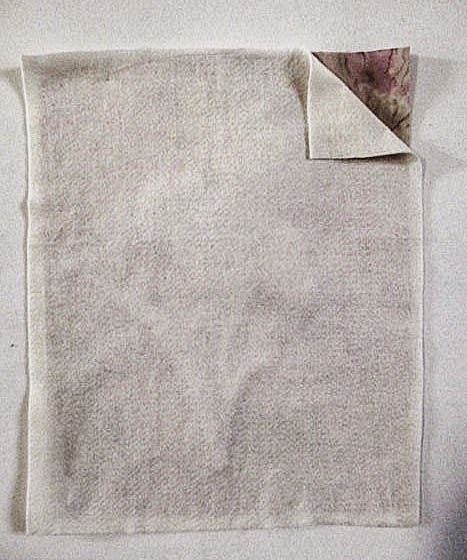 Our project for the day was making paper-fabric which is something we seem to do annually and always love it. 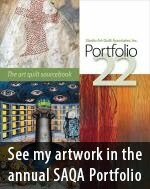 It makes into beautiful cards or backgrounds for other art. Denny is so organized and came with a theme of "time" to work on. I had no plans except I had this cute bear napkin I wanted to use. I put him down first and went from there. and ends up. 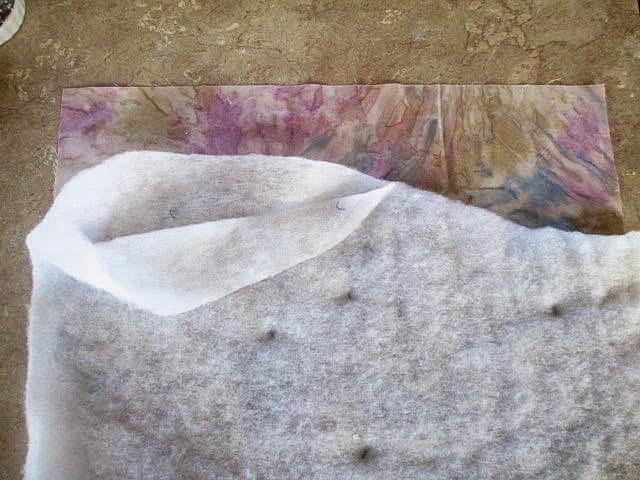 An interesting idea, Mary used soil separator cloth as her backing which is much lighter than the muslin we were using. She said she had great results and it's probably better for making into cards etc. Next time, I'll be trying that - great tip Mary. 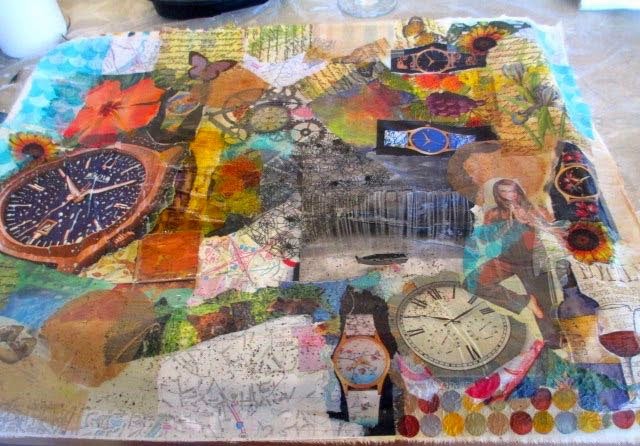 and Denny's finished "time" piece. Also failed to mention, we were fortunate today to have a studio assistant and an extra pair of paws to help if we needed it. We had a huge Show and Tell as it's been a while so more of that to come. It's gray and cloudy today and a bit chilly so perfect studio time. 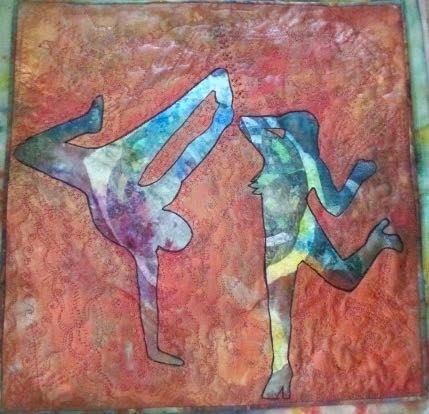 I have always loved teaching both in public school in my younger days and the quilt world after that. The wonderful people you meet who start out as students and become friends make are the best part. 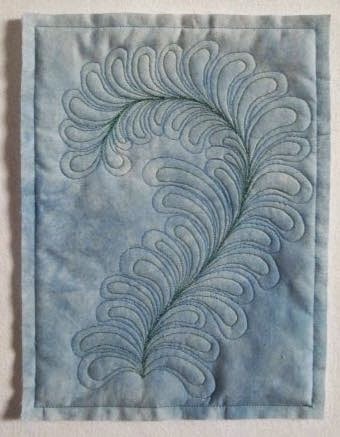 I used to do a lot of teaching in Toronto; I loved the city and the particular conference I taught at was packed full with all kinds of fiber - clothing, weaving, smocking and quilting to name a few. I've enjoyed having so many wonderful students at that conference but one in particular keeps popping back into my life. This is a joy for me, I loved this gal, not only was she a really nice person but so very talented also. Becky MacKellar took many workshops from me over the years. I remember checking my class list for familiar names and when she appeared, I knew it would be a big fun day. 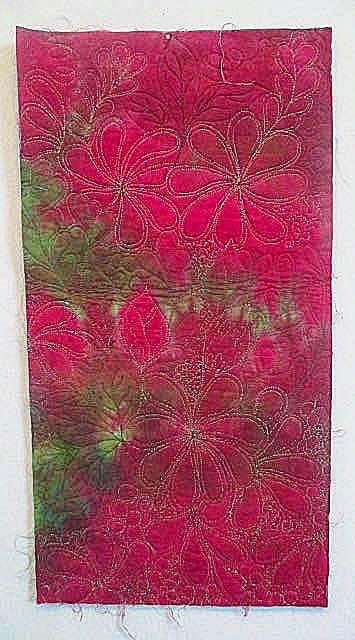 One of my workshops was on machine needlelace based on a book I had written at the time on the same subject. 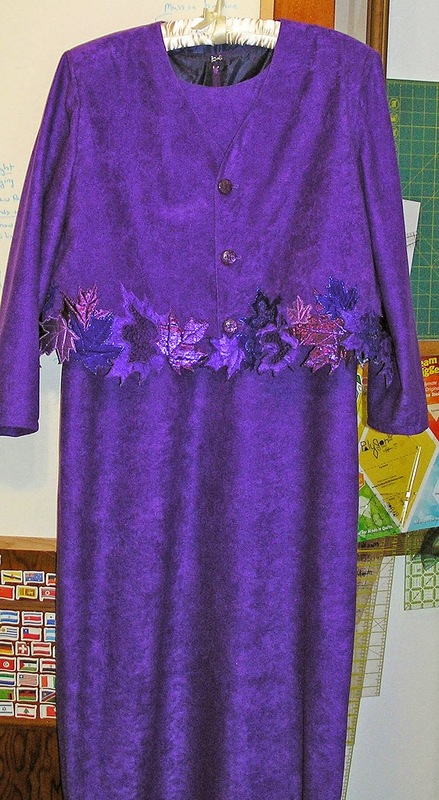 Well lo and behold, I hear from Becky a short while ago, sending me pictures of a beautiful dress and jacket she had made for her son's wedding. 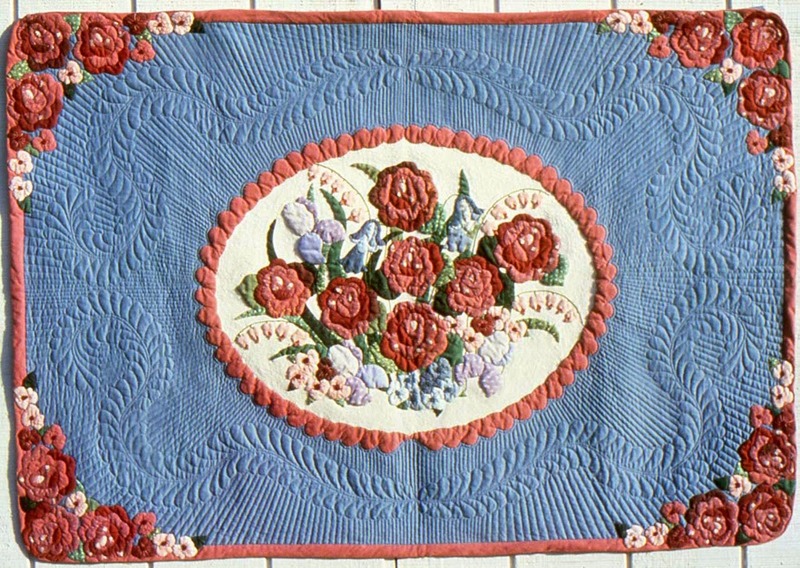 It was trimmed with needlelace. I wanted to share this with everyone, I'm always so tickled to get pictures. Here's a detail of the edge - mighty pretty and I'm sure Becky was pleased as I know I am. Thanks Becky for sharing.